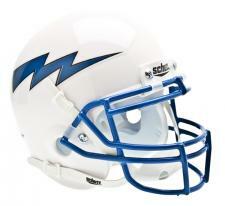 Air Force Falcons 1999-Present Mini Helmet by Schutt | Sports Memorabilia! Air Force Falcons 1999-Present Mini Helmet by Schutt. Genuine on-field helmet, scaled down to 1/4 size. Real metal faceguard, hard durable helmet shell, complete interior pad set.